When: Sat., May 4, 8-10 p.m. Please join the Humboldt State University Department of Music as they present the festive dance music of the Humboldt State Calypso Band, led by Professor Eugene Novotney. 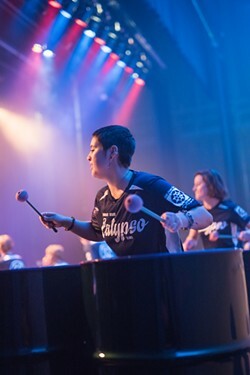 One of the most popular ensembles on the North Coast, the Humboldt State Calypso Band prides itself in maintaining an accurate and authentic connection to the roots of the steel band movement, and the innovative musicians of the Caribbean island of Trinidad. The Calypso Band will be dedicating this show to the memory of Dr. Clifford Alexis, who performed dozens of concerts with the Calypso Band over a 30 year period.